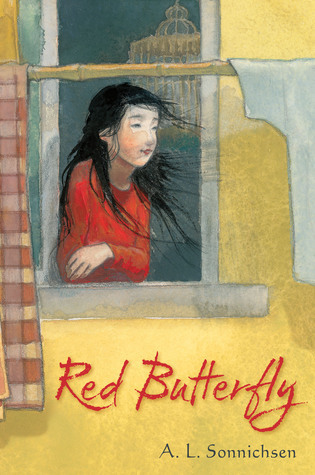 As I was reading Red Butterfly, I reflected on how unique the story was. 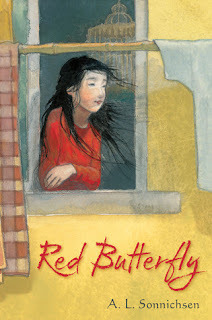 I've never read a book from the perspective of a Chinese adoptee, especially one that follows the child from her original family life to her adopted life in the US. This originality kept me reading when the plot felt too sad. Make no mistake, this is a very sad book for a middle grade audience, but it is beautiful and worthy of a read. I was confused, at first, by Kara's family life. Slowly, I learned that she was abandoned because of a malformed hand and taken in by an older American woman who was never able to get her adoption papers. They live a solitary life until Mama's older daughter has a medical emergency and their existence comes to light. Following this, Kara finally learns who she was, and needs to decide who she will be. I love novels in verse, and I think that this story was well told through this genre. One of my favorite things about novels in verse is that so much of the story occurs in the beats between the stanzas. Author A. L. Sonnichsen makes good use of this, particularly when Kara is adjusting to her new home, full of empty spaces and quiet moments. I don't this would be popular with my current set of students, but one day I hope to have a poetic child who will love this like I did.